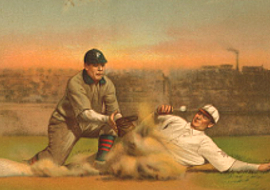 Image above: Tag play at the base. Image courtesy Library of Congress. Sponsor this page for $50 per year or all Best Players Ever Total pages for $200. Your banner or text ad can fill the space above. Click here to Sponsor the page and see how to reserve your ad. Babe Ruth, like no other player in history, combined the ability to hit and pitch at a maximum level. 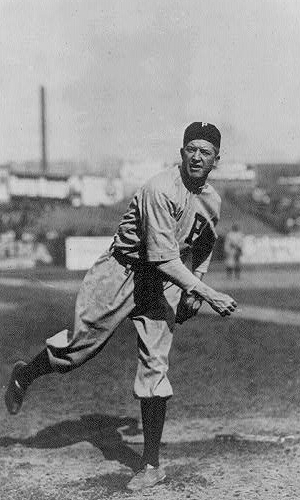 In his early career with the Boston Red Sox, Ruth was a premier pitcher, winning 23 games in 1916 at the age of 21. His Earned Run Average that year was 1.75 over 323.7 innings pitched. But Ruth was not a one year wonder, winning 24 games the next year with a 2.01 ERA. Even though it may seem so today, the era that Ruth pitched in really was not a hybrid era. That time had predominantly passed. In pre-1900 baseball leagues, it was commonplace for a player to both pitch and play a position on those days when he didn't take the mound. 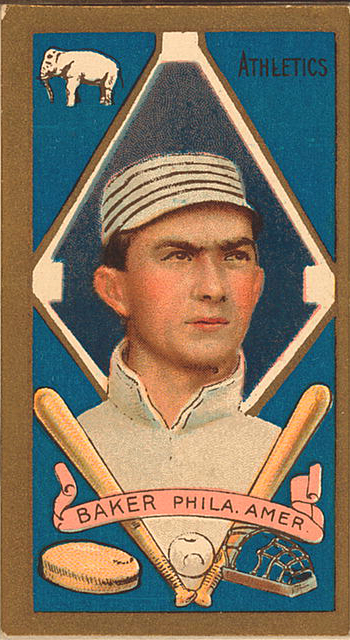 See the statistics for someone like Al Spalding for the example of a hybrid pitcher and batter who did both at Hall of Fame levels, but by the time of Ruth and his exploits, it was rare. Want more detail, check out the Stat Geek Baseball, the Best Ever Book excerpts by clicking any of the Top Five players in baseball history. Notes: Photo Credits: Babe Ruth, Eddie Collins, Frank Baker, Ty Cobb, Christy Mathewson, Grover Cleveland Alexander, and Tris Speaker (Library of Congress). Note: Age = Player age at the End of the Calendar Year. PEVA-B = PEVA Batting Player Rating. Note: HOF (Hall of Fame), HOFP - Hall of Fame Player. NYE - Not Yet Eligible. NO - Eligible, Not Elected. PEVA-P for player with higher batting total only includes PEVA above minimum value for pitching, i.e. the additional value for the pitcher per season. PEVA-B for players with higher pitching total only includes PEVA above minimum value for batting, i.e. the additional value for the batter per season. What the Best Ever Book was for batters and pitchers, Fields of Gold, Baseball's Best Glove Work does for the men with gold gloves. A unique book about the best fielders in baseball history.